Things I liked: Style, build quality.pump,lever design prevents hand pinch. What others should know: Alternatively use left and right arm for 10 pump shots.its like going to the gym. Things I liked: The NXG was well packaged and quickly shipped by P.A.. I like the ergonomics,easy plumping action, and easy BB loading. Was hoping for a new BB rifle that I could practice with in my 18' indoor range. Unable to accurately and securely mount my Tasco, 4X32 rifle scope on the rail I added an aluminum rail to do the job. I was disappointed when comparing the NXG accuracy to that of my 30 yr. old Crosman 760. Under the same conditions at 18' my 760's shot spread is 8 mm, and that of the NXG is a disappointing, scattered 32+ mm. I do like the way the NXG handles, and the raised cheek piece is just right for the added scope. Things I would have changed: The provided scope rail should be stronger and much more accurate for scope mounting. The front sight needs to be thinner for accurate sighting. The barrel should be replaced with one of rifled solid steel for most accurate results. The present steel tube barrel would be much more accurate if it were secured properly, and not allowed to move in its housing. What others should know: The NXG is a modernized BB gun, but not a good purchase for practicing with any accuracy. What others should know: It's a perfect entry level air gun... If u want in the game, get this first.. Things I liked: Nice little multi pump. Looks cool. Light weight. Shoots pretty straight. Things I would have changed: Makes my big hands sting holding that thin little lever handle when pumping. A little hard to load a pellet when a real scope is installed. A stronger rail would be nice for optics. What others should know: Nice cheap plinker. Money well spent. Add a $30-$40 scope and let the fun begin! Things I liked: This adds to my collection with M-4, 77xs, 880, and Black Ops. It has a smooth pump, and took a UTG point sight well (though UTG adapter from dovetail to weaver is needed). The APX is an economical pump rifle that shoots the RWS Basic pellets well. Things I would have changed: Nothing really. Maybe offer a version that has a pistol grip so it looks more like the Black Ops. 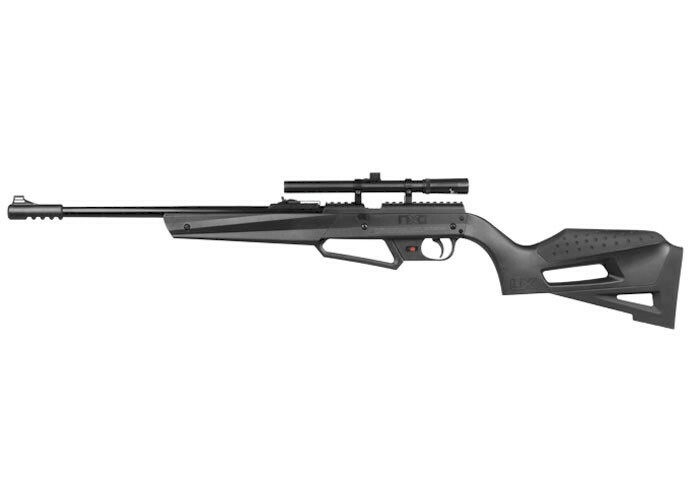 The Black Ops is the best looking airgun I have seen yet, that is at least for pump rifles. What others should know: One single criticism, and only one, is my rifle came out of the box with no power to speak of as I ran standard tests for accuracy and penetration (soup cans). Please see PA pro Tom's review at top under "Buzz". He mentions power fluctuations, but, no, I will be very clear that my rifle power was so low, and the gun so easy to pump, that my M-4 was out shooting it handily on six pumps! Tom made clear the lube job needs to be heavier on this rifle. I agree. I tried just a drop or two of Pellgun oil; it had no effect. Four rubber seals show when the pump is open. I decided to either write off this gun as a lemon or really lube it heavily. Three drops on EACH seal did the trick. The power was restored to 880 levels, and, as I got to know the gun, it talks to you when it needs lube - when there is no resistance on the DOWN stroke at 5 pumps and over, lube it. Tom talks about "oil can in hand" and he isn't joking. Think dozens of shots. Otherwise, this is a great shooter for the money. Scope Update: Switched to 4x32 scope. Much better. Point sight does not bring out full potential and is not for fine shooting. Also, Superdomes take this gun to next level for hunting and accuracy. 7 pumps. Things I liked: It shoots pellets, it's very accurate, it shoots far. It can kill any small game, very lightweight and good for your kids to shoot at targets. Things I would have changed: Get a zeroed scope, as the one included needs to be zeroed in by yourself. What others should know: When I received it, I noticed that the screw for the iron sights is unscrewable and the sights were in the wrong position. Also, the scope might fire inaccurately because when you zero it in, the top part that you need a flathead for moves around. All scopes must be zeroed by the shooter , there is no such thing as a pre - zeroed scope ! Scope must be zeroed after installing and may need adjustments for different weight pellets , also every time scope is removed and reinstalled it must be re zeroed . Things I liked: pumps easy and has predictable pressure per pump. (100' target=3 pumps for RWS 8.3g, 3' spread : 150' target=6 pumps with 5" spead same aim point) Can see the pellets in flight! (100' target=4 pumps for Crossman Premier 10.5 Magnum, 4" spread : 150' target=7 pumps with 6" spread, same aim point) This rifle is weight dependent as far as pellets go, not so much shape. 8.2g and 8.3g RWS pellets work best for me so far. Cheap and fun to shoot, kills one gallon bleach jugs at 150 feet on a regular basis. Big time stress release. Quiet, neighbors on both sides do not complain after 1200 shots. Things I would have changed: wish there was an easier way of loading the rifle. I mounted a Gamo 4X12X44 on it (I have poor eyesight) and loading the pellets can be a pain for large fingers. Add some weight, the rifle is very light and can be a little jumpy as you pull the trigger. I am no expert on trigger pull but my NXG APX trigger action has smoothed out some and seems more predictable now that its broken in. It could still be better. What others should know: I did not buy this rifle for match shooting or hunting, I bought it for stress relief and the joy of the "thwack" (the sound the pellet makes on impact with plastic) and "thonk" (pellet impact on pellet catcher/target holder). You can spend more money but cant have any more fun. After many attempt to improve the accuracy of this rifle I finally have a solution. The first task was to remove the front sight assembly from the barrel and expose the cavity around the barrel tube. Next step was to use a can of insulating foam with a 6",thin that fit in the cavity, and fill the cavity until the foam expanded out of the end of the barrel housing. The steel rifle barrel was plugged with wax paper. After a few days of curing time all the excess dried foam was carefully removed. The sight assembly was not replaced. The moment of truth came this evening when after sighting in at my 18' range, the next twelve shots produced a group, 18 mm hole in the target with no stray shots! That's as good as I can hold on a sandbag rest. That is quite an improvement over my previous results. It has proved to me that the barrel is much too thin to be secured only at the breech end. This could be an easy fix during the manufacture of other low cost guns. Things I liked: Good size, conformable, reasonably accurate. This gun produces decent power (aprox equal to the Crossman 2100) and will hit a golf ball at 60 yards consistently as long as you do your part. Not quite up to the standards of the Daisy 880/901, though it does have a more durable stock than those. Things I would have changed: The automatic safety is a bit of a pain, and could teach the bad habit of relying on the safety which is bad. I would definitely NOT recommend this to new shooters. Also I would like to see it made in a form that can be maintained, it uses machine flanged pins for the roll pin and tube enclosing making maintenance very difficult if anything ever goes wrong with the piston, valve, or hammer. What others should know: Overall a good gun for the money. Is a bit difficult to maintain do to design, and to expensive to consider disposable. It is worth having in your collection if you prefer Multi Stroke Pneumatics, though it should be a secondary with a Daisy 880/901/22X/22SG, Crosman 66/2289, or a Webley Rebel (.22/.177) as your primary :) . This is the only .177 cal AirRifle I have that does NOT like the Winchester pointed pellets. It does well with Winchester Domed, Crosman Hunting Pointed, Daisy Pointed, and Crosman CPHP (Crosman Premier Hollow Point) pellets. Still do NOT like the automatic safety, this is the only AirRifle I have that still has a safety (it is the user that should be the safety not a mechanical device [mechanical devices DO fail]). The low weight is one of the things I like about this Rifle. When hiking for a few days or more every ounce counts and the more weight saved the better. Your pumping advice seems like what I do with all of my MSP AirRifles (Crosman 66, 2289's, Daisy 880's, Daisy 901's, Daisy 22X, and Umerax NXG APX). Things I liked: Good overall feel, nice sights, rubbery stock cheek rest and shoulder pad, ramp to ease pellet loading, ease of unloading unused BBs, automatic "safety-on" with pump, "window" that permits you to see the next BB, built-in rail for scope, multi pump feature, and 4 x15 scope included (but see below). The trigger feel is very smooth and reliable and accuracy is very good even with BBs. All in all, a pretty terrific air rifle. Things I would have changed: The cocking effort was really hard at first, is now easier but is still stiffer than like. The pumping at first was real hard too but became easier with a dose of pellgun oil. When a BB is chambered there in no "satisfying click" to mark end of cycle (unlike with my grandson's Grizzly). I'm still making up my mind about the interlock that prevents pressurization without cocking and the size of the front fiber optic sight. These are really nit-picks but because it is such a nice rifle and it's a new product it's worth mentioning for future growth. The stock is just a tad bigger than I wanted for my grandson at this stage but he'll grow into it. As for the scope, see below. What others should know: The 4 by 15 scope turned out to be quite nice but it needed some work. At first I had an awful time sighting it in. In frustration I pulled off the vertical & horizontal adjusting mechanism. Turns out the inner optics tube is spring loaded up and to the right and the adjusting screws press it down and to the left, but the ends of the adjusting screws were very irregular so you couldn't rely on the sight adjustments especially in smaller increments. I lapped the ends flat with a diamond stone followed by a leather strop & reassembled. This made a big difference, making sighting adjustments more predictable and now I'm very happy with it. I've had the rifle for less then a month so I can't say about long term durability but this really seems to be a worthwhile product and a good next step from the Grizzly in my grandson's training. I got my NPG under a year ago now. I found mine shot very well with the RWS Basics. That is, I thought that till I bought a tin of the RWS Meisterkugeln wad cutters. I urge you to buy a tin, and sit down and try grouping. These are THE pellets for mine. 28 Aug, 2015. I've had this gun for the better part of a year now. Maybe mine is an exceptional sample but it gives me a lot of joy so I'll make one last comment. I have a range in the back yard with soda cans and one liter plastic bottles (on stakes so they tilt towards the shooter. This guides ricocheting BBs downward into the ground). The distances are 33, 43, 55 and 63 ft. With BBs it's pretty easy to hit the first three bottles just about all the time and the 63 ft bottle better than half the time. With pellets, using the scope that came with the gun, I can hit a soda can at 63 ft most of the time and anything closer pretty much all the time. I make no provisions to trap the BBs but I do try to trap the lead pellets for environmental reasons. I Shoot both BBs and pellets. It is a fun gun, pick up, shoot, put away, forget till the next time. For a gun that asks so little, it sure delivers a lot. I'm kind of surprised there aren't more reviews. This gun continues to amaze. With Diabolo basic pellets same conditions as above, got a 4 out of 5 into one ragged hole you could cover with a nickel. The manual suggests 2 to 10 pumps. We shoot in the back yard so most of the time it's three pumps. Today I tried two. Surprisingly, bb control was still good with the added advantage of being able to see the bb as it neared the target (used the scope). This could be very useful in instruction. After using this for a while, I would change accuracy to 5 stars. This afternoon I had a 9 out of ten shot group in a 1 in radius circle at 32 feet with Daisy zinc plated BBs. The tenth fell just outside the circle. (20 Nov, '14).